A frantic search is underway for an infant reportedly abducted from her crib in a Kansas City, Mo., home late Monday night. 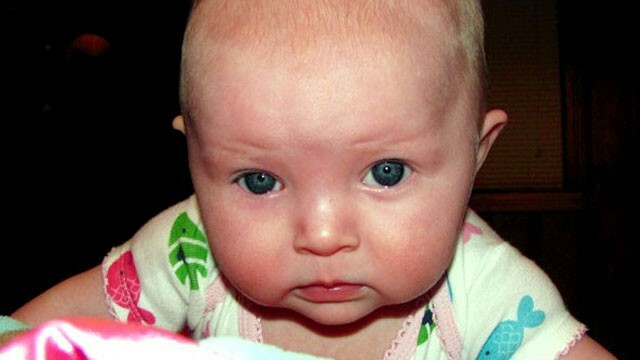 Ten-month-old Lisa Irwin was last seen by her mother, who laid her down to sleep at 10:30 p.m. The child was discovered missing by her father at 4 a.m. when he returned home from work. The parents immediately called police. An Amber Alert has been issued for the child and authorities are canvassing the suburban Kansas City neighborhood and nearby wooded areas. "Hopefully the child's close and safe, but right now we're utilizing all available resources," said Officer Darin Snapp, a spokesman for the Kansas City Police Department. The FBI is assisting in the investigation and authorities warned that the kidnapper may have already crossed state lines. "It's very possible that this child could be in Kansas," said Snapp. "We're right on the state line." As yet, police have no suspect description, no vehicle description and no eyewitnesses to the abduction. "It's very frustrating," Snapp said. "We're hoping somebody comes forward and gives us the right information." Police said the kidnapper may have gained entry to the home through a window in the child's room, which showed signs of tampering. "Somebody could have entered through the window and abducted the child that way," Snapp said. "We don't know for sure yet." Lisa has blue eyes and blond hair, is 30 inches tall and weighs 26 to 30 pounds. She was last seen wearing purple shorts and a purple shirt with white kittens on it, police said. The child has two bottom teeth and a beauty mark on her right outer thigh. Her parents said she also has a cold with a cough. An officer at the scene told KMBC-TV that the child's disappearance was especially concerning given the fact that the abduction was reported by both parents. "I realize that some of these Amber Alerts involve parents or parental abductions, but we have both the parents here. So that puts us on a little higher state of alert," police Sgt. Stacey Graves said. The father had just started a new night job last night. The mother put her to bed at around 10:30 and the dad checked her when he got home from work. There is a broken spot in her bedroom window. The Police and FBI did a graph search of a hill side Rappeling off it. They have brought in dogs. A neighbor said she saw a man with a baby in just a diaper going toward a house in the neighborhood during the night. LE say the parents are being very copoperative. The father called 911 right away and then went door to door to see if anyone had seen anything. LE have searched all the neighboring houses. This is from a local rumor the dad bought the house in if I remember right 2002. He had a different girlfriend who moved out about 2 years ago,The mom moved in shortly after and later her 2 boys from a previous relationship moved in. The family spends alot of time outside in the yard. Hope I didnt forget anything. My gut tells me the parents didnt have anything to do with this, Not sure why I think this but I do. There is a video at the link, didn't embed it as it auto plays. I have to say that I really don't find it odd that the baby didn't have pajamas on, my kids sometimes don't put my grandkids in pajamas, I've never asked why but I suppose if they've fallen asleep in their clothes they just put them to bed like that. Also if the Mom put the baby to sleep at 10:30 pm, regardless of a cold and cough, she might of went to bed too and fell asleep. The Dad got home only 5 1/2 hours later, I don't think it's all that bad. I think if my son and wife put my grandson to bed and the circumstances were the same, if they fell asleep too then easily they could sleep 5 1/2 hours but they do have a monitor on in his room and theirs all the time. I pray this baby is OK!!! The thing that bothers me is the woman who says her husband saw a man with a baby wearing only a diaper out at night. I am hoping this baby was taken by someone who wants a baby to love and that she is being cared for. Praying for a good outcome to this! * 800,000 children are reported missing every year. That is about two children every day. * Of the children reported missing, 350,000 are family abductions. That is, they are taken away by family members in violation of custody agreements. * Non – family abductions amount to 204,000. These include kidnappers who are acquaintances or complete strangers to the victims. * Only 115 of non-family abductions are stereotypical abductions, defined as those in which a child is detained overnight, transported atleast 50 miles, held for ransom or intended to be kept permanently or killed. * The rest of the 800,000 missing cases include runaways, throwaways, or lost children. I do not believe the mother in this case nor in the Aliayah Lunsford case - I believe the mother or both parents are responsible in some way - and someone will have to prove me wrong! Kansas City police say they have not identified a suspect in the case of a 10-month-old girl who authorities say apparently was abducted from her Northland home. Detectives met early Wednesday morning to determine the next step in the investigation. Video at the link, can't embed. I guess what I meant about the PJ's was that if the child was ill - normally you would not dress the child but leave them in their pajamas - It depends of course on their routine and if the child were well and not sick I wouldnt question it. Its the small details that sometimes help to solve a case. Its just one that bothered me. Statistics don't lie, but people do. kc has certainly taught us all that. Must see video at the link. Parents speaking at a presser. I still remember Kyron Hormans stepmother crying at their press conference - where is Kyron? Mo. 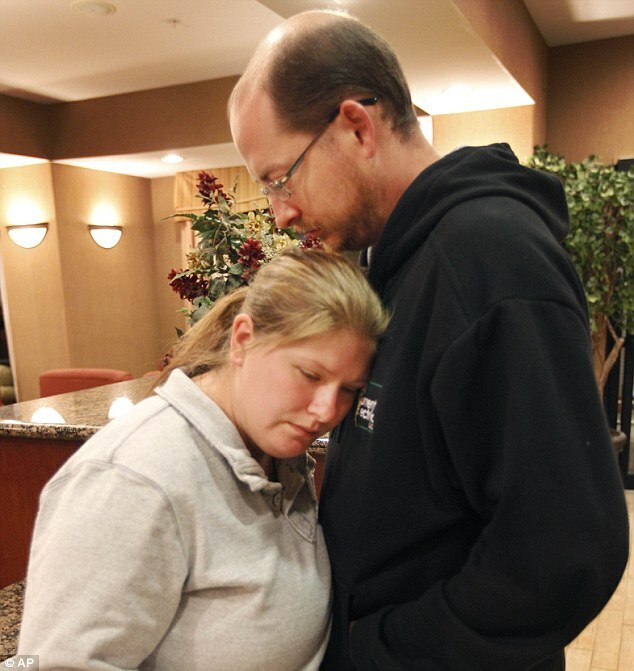 parents describe panic after baby disappearedKANSAS CITY, Mo. (AP) _ The parents of a 10-month-old girl who was apparently snatched from her crib said Thursday that they frantically searched their Kansas City home for any sign of her but found only an open window, an unlocked front door and house lights blazing. Whoever took Lisa Irwin either late Monday night or early Tuesday also stole the couple's three cellphones _ including one that doesn't work, Jeremy Irwin and Deborah Bradley said during a tearful news conference. This mother told LE she was reprogramming their 3 cell phones and left all 3 on the counter and now all three are missing, she thinks stolen along with the baby. This seems a little TOO convenient for me and I suspect those cell phones are an important link to the truth. How about the neighbor reportedly seeing an infant in a diaper. Have we heard more about that? Could they have sold the baby? So many questions. So they went from helping to not cooperating, sounds bad to me. I dont like this business of the cell phones, everyone knows you can track people with cell phones by gps. Did they not have a land line? KANSAS CITY, Mo. — The parents of a missing 10-month-old Missouri girl are no longer cooperating with investigators, police said late Thursday — an assertion the family quickly and firmly denied. The parents of a missing 10-month-old Missouri girl late Thursday indicated they are cooperating with detectives, counter to what police said earlier in the evening, a relative said. A woman who identified herself as Ashley Irwin, sister of Jeremy Irwin, read a statement on behalf of her brother and Deborah Bradley, parents of missing infant Lisa Irwin. "We have never stopped cooperating with the police. We've been cooperative from day one and we continue to assist the police with the investigation," the statement said. "The main goal has always been to find Lisa and bring her home. That remains the sole focus of the parents." Ashley Irwin said the parents, who will release another statement Friday, wanted to thank police and the community for their efforts and prayers. Kansas City, Missouri, police Capt. Steve Young had said earlier that the pair had stopped assisting police in the investigation. "I don't have to illustrate how that affects the investigation," Young said of the development. "It speaks for itself." Young, who said "our door is always open" to the parents, told reporters that there are no suspects in the case. Earlier Thursday, the parents told reporters about how they discovered Lisa to be missing. "She's everything," Bradley said of Lisa. "She's our little girl. She's completed our family, and she means everything to my boys. We need her home. I can't be without her." Irwin urged anyone with information to call police. "Anything, even the smallest information, could help lead to her return," he said. Lisa Irwin was last seen around 10:30 p.m. Monday, asleep in her crib, police said. They were called to the home at about 4 a.m. Tuesday. "It appears the suspect entered/exited through a bedroom window," authorities said in a statement. "Evidence at the scene leads police to believe the child has been abducted." Jeremy Irwin told reporters that he found Lisa missing when he got home from work. "The front door was unlocked," he said Thursday. "Most of the lights were on in the house, and the window in front was open -- all very unusual." The couple claimed three cell phones were missing at their home, Young said, but the information has not turned up anything. Police have said the parents are not considered suspects in Lisa's disappearance. Young on Wednesday told reporters the family had been cooperative, but "everything is still on the table. We haven't ruled anything out." He said then that investigators "really haven't developed any good, hard information that we can go forward with." Nearly 50 tips have been received through a hotline, he said, but not all of them have been pursued, as some of them have been vague -- a person calling to report a child seat seen in a car, for instance. "I know everybody's hearts are in the right place, but that's not anything we can do anything with," Young said. Police have conducted more than 300 "knock-and-talks" and searches of residences in the area, and more than 300 officers were searching for Lisa. There have been three searches of a wooded area near the family's home, he said. "I promise you, if there's anything we think we can be doing, we've probably done it two or three times already," Young said. An Amber Alert was issued for Lisa early Tuesday but has been canceled. "Although the investigation and search for Lisa Irwin continue, an active Amber Alert is no longer necessary in this case," police said. However, Lisa is still considered missing and endangered, according to authorities. Lisa is described as 30 inches tall with blue eyes and blond hair, police said. She weighs between 26 and 30 pounds. She was last seen wearing purple shorts and a purple shirt with white kittens on it. She has two bottom teeth, a small bug bite under her left ear and a "beauty mark" on her right outer thigh. She currently has a cold with a cough, police said. Kansas City police took the unusual step Thursday of announcing that the parents of a missing 10-month-old girl are no longer cooperating with the investigation. The baby's parents, Jeremy Irwin and Deborah Bradley, responded on TODAY Friday. Police say the parents of a missing 10-month-old Missouri girl Lisa Irwin have stopped cooperating with authorities. talking to detectives, and I don’t have to illustrate how that affects the investigation. That speaks for itself.’’ The police still say there are no suspects in the case. Bradley also admitted on Friday that she had failed a voluntary lie-detector test that was administered by police. .Irwin has not taken a lie-detector test but said he would undergo one if necessary. Lisa home where she belongs, and if that’s what it takes, that’s what we can do,’’ Irwin said. In a statement Thursday night, the parents insisted they've been cooperative. There is speculation that the police are trying to pit the parents against one another to determine if one of them had anything to do with their daughter’s disappearance, which occurred in the early hours of Tuesday morning. Both were asked by Lauer whether they had any suspicions that the other one may be involved in their daughter’s abduction. Investigators lifted manhole covers and searched the wooded area near the couple’s home again late Thursday for any sign of Lisa Irwin. Now, they have taken down the crime scene tape around the home and have shut down their nearby mobile command center. Bradley thanked the FBI, Kansas City police, and the National Center for Missing and Exploited Children for their efforts in the search for their daughter. Authorities announced Thursday they were shutting down the command post about a mile from the family home. Police spokesman Darin Snapp sent out a news release saying authorities believed they had done everything they could "regarding geographic searches." .Authorities released few other details and reiterated they still have no suspects. Kansas City police spokesman Steve Young declined to elaborate on what would happen to the investigation without the parents' cooperation. Kansas City police spokesman Steve Young said Thursday night that Deborah Bradley and Jeremy Irwin have decided to stop talking to detectives. He didn't provide details, but he did say their failure to cooperate could hurt the investigation. "They clearly don't want to participate," Young said. Asked after the news conference what would happen to the investigation without the parents' cooperation, Young said he could not comment. Of the 278 infant abductions nationwide in the past 28 years, only 12 of those children did not return home safely, according to the National Center for Missing and Exploited Children, which is assisting the family with the case. Parents and family members are often the main suspects in child abductions. Of the 800,000 children that are reported missing every year in the United States, an estimated 200,000 are abducted by family members and 58,000 by non-family members, usually with a sexual motive, according to the National Center for Missing and Exploited Children. Is the parents story unravelling? Failing a polygraph? Not a good sign. Listening to Clint Van Zandt on msnbc TV and his interview makes me believe he does not believe the parents, especially the mother. The husband looks like a deer caught in the headlights. With more than 72 hours passed since Lisa Irwin went missing, the investigation into her disappearance has taken a few abrupt turns. Some by way of statements made (and not made) by her parents, and others by way of statements made by KCPD Captain Steve Young. I’d like to just list a few things that I’ve noted that bother me (i.e. seem hinky to me). In a report filed by John Pepitone with FOX 4 News out of Kansas City it was pointed out that if you take the statements made by law enforcement prior to interviews conducted with Lisa’s parents yesterday and then compare them to revelations made during those interviews, there appears to be a problem. Prior to the interviews yesterday, law enforcement had stated that “no other items” were taken from the home; just little Lisa. However, yesterday it was revealed by the parents in a media interview that three cell phones were taken. The couple states they discovered the three phones missing when they decided to call 911 after searching for the baby in and around the house. I don’t personally find that they had 3 phones or that the 3 phones were all together hinky. Deborah Bradley, Lisa’s mother, states that one of the phones was not working and she had had them all together on a kitchen counter reprogramming one of them. This makes sense if the third phone was a new one and she was entering the phone numbers into it by going through the contact list on the other two phones, one of which was being replaced. However, I have a big problem with the idea that someone would walk into a home (apparently either through the front door, or through a front window), turn on most of the lights in the house, abduct a baby while the mother sleeps in a nearby bedroom, and then take three cell phones. Of all the things you wouldn’t want with you, a cell phone which at any moment could be called and the ping track your location, is the last thing you’d want to take. Considering the intruder would not know one of the phones was not working, that would mean this abductor decided to triple the odds that an incoming call on any one of three phones could end up establishing their movement, or ultimate destination. In the interview, Deborah speculates that maybe the phones were taken to try to prevent them from calling 911 once they discovered the baby missing. They also state that the phones being missing is what led to a “delay” in them calling 911. So my first question, one that I do not believe we have been given any information on, is…exactly how much time passed before a 911 call was made? If it was more than a few minutes, I’ve got a big problem. Because waking the neighbor up at 4 to 4:30 in the morning to get them to call 911 is exactly what I would do next if I found my only form of communication absent and my baby missing. So what is the time of the 911 call? How long after 4 am before it was made? It is disturbing to hear that the missing cell phones may not have been originally reported to law enforcement. Does this mean that the police questioned the parents about why there was a time delay after 4 am before the baby was reported missing and then after a day (or 2) of questioning they reveal, not to the police, but to media, the reason (or excuse) for that delay? That a person might walk into an unlocked front door in order to take a baby is not unbelievable. But something that does bother me is that the same person would walk back out through that front door carrying a baby they’ve just stolen. No mention has been made of any backdoor being unlocked or open, or even possibly an egress route for the abductor. In fact, statements to date have indicated the abductor left the way they came. Of course, the whole idea that a baby abductor would walk in through the front door, flip on all kinds of lights in the house, steal baby, grab 3 cell phones and walk out the front door all is very hard to believe. This is beyond brazen, these would be acts of a person who is operating with impunity. Another thing that changed in the accounts we’ve heard from the parents so far was the last time Lisa was seen. Originally we had heard that Deborah put Lisa to bed at 10:30 pm. However, yesterday Jeremy stated that Deborah put Lisa to bed at about 7 to 7:30, her normal bedtime, and then check on her at 10:30 before going to bed. Of course, Jeremy would have no firsthand knowledge of what actually happened after he went to work, right? BUT, he could have been at home if the baby was put to bed at 7 to 7:30. If he was working a full 8 hour night shift and returned home at 4, that would place him going to work sometime around the 7 to 8 o’clock hour. Deborah said something in an interview with media that perked my ears. She stated that at 10:30 pm when she either (according to which version you want to go with) put the baby to bed, or checked on her after previously putting her to bed, that 10:30 pm was “the last time we saw her”. Well, whose “we”? Is she actually referring to putting Lisa to bed at the earlier hour, when possibly Jeremy was still home? Did she really check on the baby at 10:30? And I do, personally, have a problem with the idea that a sick 10-month-old baby (the parents report Lisa was sick and had a cough) could sleep from 7 pm to 4 pm and not awaken. A parent is pretty lucky when their 10-month-old baby is sleeping through the night consistently, they are extremely lucky when a sick baby with a cough sleeps through the night. Another discrepancy that has come out between what Deborah states and what Jeremy states is where the older boys were. Deborah states she was sleeping with the boys (plural) in her bed. However, Jeremy states that when he got home and found the front door unlocked, the lights on and a front window open he first “checked on the boys” and then on Lisa. In addition, he explicitly states that Deborah was sleeping with the 5-year-old boy in her bed….indicating that she was not sleeping with the second boy. Why these differences? In a statement made last evening by Captain Steve Young of the Kansas City Police Department he reported that the parents had “stopped cooperating”. Jeremy’s sister read a statement on his and Deborah’s behalf last evening that contradicted this and stated they had not stopped cooperating. However, in John Pepitone’s report yesterday, it was revealed that earlier in the day a witness at the Command Post had witnessed a very “animated” conversation between the parents and the police. Pepitone reports that there were raised voices, flailing arms and the conversation (argument?) ending with the parents getting in their vehicle and speeding off. At this point I’m just watching this tragedy unfold. The above observations are not to state I’ve concluded Lisa’s parents did something to her, but they are points that make me go…hmmm. I personally don’t like discrepancies…not when they are connected with the last hours of a baby’s known whereabouts and the time at which the baby is discovered missing. I think the thing I’d really like to know is exactly how much time after 4 am passed before that 911 call was made? its extremely rare and from the beginning I frankly didnt believe the mothers story. I have no doubt that those tears are real - but they could be shed for her knowledge of what she or the father has done. October 6, 2011 - Like this? Subscribe to get instant updates. KANSAS CITY, Missouri (Isabelle Zehnder reporting) -- The parents of missing Missouri baby Lisa Irwin appeared on camera again early Thursday pleading for the safe return of their tiny daughter and offered information not before revealed about the night she went missing. It should be noted that abusive parents use the child's name rarely during interviews. This is a distancing process that an abusive parent goes through to separate himself or herself from guilt that bothers them. They often will use the child's name less than 10% of the time, instead using only the pronouns instead of the proper name, knick name, or term of endearment. "We" is considered appropriate when both parents are together, answering questions. Any change, however, should be noted. When it comes to male/female, we find that mothers most often say "I", and fathers say "we"; with the exception being stepmothers, who mostly say "we". The use of "I" is stronger and personal. Note that she wants her back "safe" not just "back"
Late Monday night or early Tuesday morning police believe someone broke into a window and abducted the sleeping 10-month-old baby girl who only has two teeth and was wearing purple shorts and a purple shirt. The last time Lisa was seen was around 10:30 p.m. Monday night when her mom, Deborah Bradley, put her to bed. It was the baby’s dad, Jeremy Irwin, who discovered Lisa was missing from her crib at around 4 a.m. Tuesday morning. He told police he had returned home after working a night shift as an electrician, went to check on the couple's children, saw their sons sleeping, and noticed the baby's crib was empty. The couple said they ran around the house calling out the baby’s name and waking up their two young sons. The boys started crying as they scrambled to find a phone to call 911. “I came home from work and the front door was unlocked. Most of the lights were on in the house. The window in the front was open. "Obviously that was all very unusual. Then I started checking on the kids – I checked on the boys first and then we checked on her and that’s when we realized she was gone,” Jeremy said. Always note when a subject reports beginning an activity. Note "I" started checking on the kids became "I" checked (appropriate past tense) on "the boys" first and then "we" checked on "her" and that's when "we" realized she was "gone" (rather than missing or not there). The change from "I" to "we" is noted. When one subject claims to know what the other was thinking, it should be considered sensitive. The use of "we" with regard to thinking ("we realized") is sensitive and weak. It is also the inclusion of emotions/thoughts at the logical part of the account. Because they have given us a lot to analyze, I have become increasingly uncomfortable with the plural pronouns they use, in particular, the use of "us" being hugged. Christopher Dillingham's work has shown that guilty parties will use "we" to the point of overuse in that it is something that makes them feel safer; as if the spreading out of the guilt lessens the pain of it, and "shares" responsibility. The plural is consistent, but I would expect, especially when speaking about actions, that the father would say "I said..." or "I hugged", and so on. In analysis, we note "so, since, therefore, because" as it tells us why, and not what. Here, Jeremy tells us "why" he'd like to have her back: "so she can have her Barnie" is listed before she can have her family, her brothers..."
Lisa's mother had said "we are trying to be strong for the boys", which caused me to question whether she felt the need to be strong for Lisa. The parents appear to have an aversion to using Lisa's name, and an aversion to speaking for themselves, with the strong, personal, "I" that is expected from parents; especially mothers. Jeremy previously had said, under the conditions that were initially portrayed (kidnapping, open window, etc): "to whoever might have her" which, given the addition of this one simple word, "might" indicates that in Jeremy's mind, there is another option besides kidnapping. I expected him to say "to whoever has Lisa, please...."
Words are chosen in less than a micro second and should be listened to carefully. Here, he presupposes that someone has her, and not "might" have her and now tells us why they took his phones. It was at this point that their stories seemed to raise more questions, as when the mother spoke about them phones, she went out of chronological order. This may be the "gaps" that she could not fill in for police. Note that he says the phones were taken so "we" not "he" couldn't call...the police? This would have been expected. Instead he says "so we couldn't call anybody"; which would mean others besides police. If the police release the 911 call, the analysis should show much. this was a good question and it appears to me that Jeremy was not expecting it. Why do I think this? Because he answers it unlike the way he answers other questions: With the pronoun, "I" taking ownership of the statement. Note the "think" reduces commitment. "I think I locked my keys in the car", which shows room to "think" something else. If your baby was kidnapped late Monday night, early Tuesday morning, by Friday morning, do you think you would have already asked your sons if they had heard anything? Most parents would have asked them immediately. His speculation that he only "thinks" is a red flag. Deborah clarified that the window was in a computer room that’s also used as a second living room. A broken sentence shows that the subject stopped herself, and is withholding information. Since both parents rarely use Lisa's name (see Ronald Cummings), we cannot be sure if "she" is the "somebody" (singular) who took her baby. Please note that the husband said that "they" took the phones so "we" could not call "anybody". Note that somebody only "wanted" a baby; not that someone took her baby. There is a distinction. She looked over at her husband, tears streaming down her face, trying hard to hold it together so she could complete the interview and get the message out about her daughter. Please note that when a child is called "ours" it is usually an indication that a step parent or step child is involved (either married or unmarried) or that the child is a foster child or adopted child: in other words, some reality exists in which a child is shared. Note that she says "my boys", that "she" (not Lisa) means everything to...my boys. I expected to hear "she means everything to me" or "she means everything to us"; but only to "my boys". Note the change, which is stronger: "I can't be without her"
Why does the mother appear to avoid, in interview after interview, the use of the name "Lisa" or a nickname, or term of endearment? In guilty cases of child abuse, there is a process of which a parent must go through, internally, before a child is abused. There is a de-personalizing of the child, and we sometimes see that the child's name is used only 10 or 20% of the time. See Desiree Young's use of "Kyron" and measure the frequency (it is high), as well as nicknames and terms of endearment. We are told what the boys called her, but in the parents own speech, there is an avoidance of the use of Lisa's name since the first press conference. This is indicative of child abuse. (see Ronald Cummings). It is not that the abusive parents won't ever use it, it is used far less than non abusive parents. In all their television interviews, how often have either of the parents used the name, "Lisa"? Here, the kidnapper is not a woman who wants a baby, but is plural, "they", which is an indication that Deborah is not speaking from memory; as both parents have shown inconsistency. They have claimed to have no idea who could do this, yet gave police the names of 9 people who they suspect. The window that appeared to be tampered with was not the baby’s room as many have suspected. Instead, it was an office used as a second living room, Deborah said. While discussing the cell phones that had been taken from the home, Deborah said, “They were on the counter in the kitchen. And there’s, uh, whenever we woke up … I woke up … and he came home and I, and he said ‘she’s not in her crib’ and I said ‘what do you mean she’s not in her crib?’ and I just knew, you know, that something was really wrong. 1. Note that she stops herself from finishing a sentence indicating that she is deliberately withholding information. When she begins with "whenever we..." reflects time frame, which she said police found to have gaps. To this, her broken sentence agrees. 2. Note that she said "we woke up" and "I woke up"; the change of pronoun is deceptive. 3. "and she was nowhere" rather than 'she wasn't there" or even "Lisa wasn't there". 4. "They were gone". She did not see them on the counter and concluded that they were "gone" and not in another drawer or anywhere else (she has two boys). This suggests that she believes police won't find the phones. Please see prior analysis on Shaken Baby Syndrome, posted today. This is a strong indication that Deborah knows exactly what happened to her child; who's name she appears to struggle to pronounce, an indicator that something happened to Lisa in which the mother knows but fears to tell police. I think this case may end in a confession. Deborah pauses to catch her breath as she continues sobbing through the interview. Phones (and drugs) do not sit nor stand. Research has shown that when someone refers to drugs as sitting, it is often an indication of deception, where the subject is concealing information about the drugs. Phones do not sit. The use of this word may indicate that the mother wishes to deceive about the topic of the phones. It is suspicious that it took so long to mention the 'missing' or now 'taken' phones. The order of "door, windows" and then on to the "phones" suggest story building. When asked what else was taken from the home, Deborah said they didn’t look and that she doesn’t think anything else was taken. Jeremy said he agreed that nothing else was removed from the house. “Police came and I waved them down. I mean I didn’t even check around the house. I didn’t even think to care about any of that. I still don’t,” Deborah said. Please note that most people say "police" and not "cops" to children. Here, "we called the cops" is suspect. Note that "cops" were called, but "police" came; what prompted the change of language? Negation: Note as highly important (sensitive) any time someone reports what they did not do, or did not think. Here she tells us she did not "even check" and "didn't even care to think about that" which, both statements are likely truthful: She had a reason not to "check" the house, nor to "care" about "that" because she knew that Lisa, the child's name she appears to struggle to say, wasn't there. This has two negations in one statement. Please note that "you know" is a habit of language that should be noted where it shows up, and where it does not: it shows an acute awareness of the presence of the interviewer. It should be considered in the analysis. 1. "...put fresh clothes on her, and get her ready for bed. Give her her bottle..." drops the pronoun. Note it is not "I gave" her the bottle, but slips into present tense language indicating that she is making this up as she goes along, and it did not come from memory. 2. Unless she says that she gave her the bottle, we cannot say that she did. Please note that she "sleeps" with it and not that she "slept" with it. This indicates fabrication as it is present tense and violates our principle of first person singular, past tense. 3. "That was it" is the same as "and that is all I know" which indicates that the subject wants the story to end. This shows that the story of how she put her to be is a sensitive topic she wants to end. Wanting to end the account and the dropped pronoun and the present tense language all indicate a willful deception on the part of the mother. This is why she would fail a polygraph. The parents have spoken about themselves and how they are handling it. I have yet to hear the parent say what Lisa would be going through at 10 months and in the hands of a stranger. No mention of food, medicine, nor anything else. At 10 months, children have a natural stranger anxiety. Neglected children often will go with just anyone. The interviewer confirmed the parents had said they didn’t know anyone who might have wanted to do this and asked the couple if they'd noticed anyone who might have had an unusual interest in the baby. Abusive parents use their child's name less than 10% of the time, far lower than loving parents. Abusive parents depersonalize the child, and create distance. Neglected children (she is not part of "the boys") will lack natural stranger anxiety and go with strangers. Asked if she thought Lisa would have cried if someone picked her up from her crib. Deborah she said if someone cuddled her she probably wouldn’t cry. The mother does not use Lisa's name. The mother may have failed the police polygraph to which Statement Analysis agrees. The mother knows what has happened to the child. Both mother and father are involved. Thank you for all the posts today on this case argal. I have been out of it for awhile not wanting to comment on another missing baby. I have been reading the story at it unfolds. All these missing children and babies really get to me. What is puzzling to me is why this case is drawing so much more press than the Aliayah Lunsford case. I don't have any thoughts on that but I wonder the same thing Artgal. Have you noticed it's been on our local news? I've seen it a couple of times. Strange. Law enforcement authorities today were searching the Johnson County Landfill, located in Shawnee, for a baby reported missing out of Kansas City, Mo. Tom Coffman of Deffenbaugh Industries, which owns and operates the landfill at Interstate 435 and Holliday Drive, confirmed that authorities were on site looking for the child. Coffman said Deffenbaugh was not allowing members of the media onto the property, although television news crews were filming the search via helicopter. An FBI spokeswoman told local media that today is the second landfill search, with the first being the day Lisa Irwin, 10 months, was reported missing. Lisa's parents reported her missing from their home in the 3600 block of North Lister Avenue on Tuesday, according to local media reports. Authorities issued an Amber Alert that day and continue following leads to find the child. The case has gained nationwide attention, with Lisa's parents granting interviews on "Good Morning America" and the "Today" show Thursday morning. Coffman said that while the landfill has been searched many times over the years in connection to various criminal cases, no bodies have been found there. The parents of Lisa Irwin appeared this morning on national news shows and said they were frustrated with the tactics of Kansas City police investigators. Local police representatives, meanwhile, insisted Friday that the search continues for the missing 10-month-old girl despite the parents’ decision to stop talking with police. “Our main focus is finding Lisa Irwin, and we hope to continue the cooperative communication that we have had with the parents,” said Sgt. Stacey Graves, a Kansas City police spokeswoman. Early Thursday evening, a police spokesman announced that Jeremy Irwin and Deborah Bradley, the parents of Lisa, no longer were cooperating with the police. Later that night, Ashley Irwin, an aunt of Lisa, told reporters that Lisa’s parents were, in fact, continuing to assist authorities. Friday morning, appearing on “Good Morning America” and the “Today” show, Lisa’s parents said they had been upset Thursday by how they were treated during long interrogations. “From the start, when they’ve questioned me, once I couldn’t fill in gaps, it turned into ‘You did it, you did it,’ ” Bradley said. “They took a picture down from the table and said ‘Look at your baby!’ And ‘Do what’s right for her!’ I kept saying ‘I don’t know…’ I just sat there. Irwin said he told authorities Thursday that he needed a break from their questions. “I told them I had to have a break — no more questions today,” Irwin said. “I asked to be let go, and they let me go from (the) police station. Also on Friday, Bradley said she voluntarily had taken a polygraph test this week. During a subsequent police interview, she added, detectives told her that she had failed the test. She couldn’t recall, she said, which questions she apparently had failed to answer correctly. That analysis was mind boggling. So many things can be read into the way that people form a conversation by asking questions... We, I, They, Them etc. The referencing to the JonBenet Ramsey case. Her murderer was believed to be hiding under a bed in the house for some period of time and was there long enough to pen that incredibly long ransom note. (That person didn't just pop in and out to steal a child.) I also remember when the Ramsey's stopped co-operating with the investigation. Police were focusing their attention on the family instead of searching for the actual perpetrator. Ronald Cummings used the phrase "My Daughter" alot instead of calling her Haleigh. Even from the beginning during the 911 call he's heard cussing at Misty using the words "My Daughter" Does this imply he's to blame for her disappearance? Are these parents guilty or innocent in the disappearance of their little girl? Who the hell knows. Could all the confusion in their words be the result of the fact their infant is missing, they are being interrogated by police, interviewed with cameras in their faces for the first time in their lives? We always hear that statistically the parents or persons residing in the home are the ones responsible for committing these crimes. But in my opinion that's about a 50/50 claim. I have given this case much thought. I dont like that the father asked for questioning to be stopped or that the mother failed even 1 question on the polygraph.I think if I was told id failed a polygraph I would want to know which question I failed. She cant remember which one it was? I think that would be emblazed in my mind. If your going to kidnap a child are you really going to take the time to look for cell phones and turn on lights all over the house? Also wouldnt you take the baby bottle and pacifier that were both said to be in the crib? Something just doesnt ring true here I just cant put my finger on it. When watching the parents in interviews, I cant decide on what to take of thier actions. Dad looks like it is all a big bother to him or that hes dumbfounded. Mom seems to be pretty shook up and sorrowful,but also looks like shes putting alot of thought into what emotion to portray at the moment. Im wondering if the focus is too much on the mother. It could be that she passed part of the lie detector because she truly didnt hurt or kill the child but was deceptive if they asked her what happened to the child maybe the husband did something. Also if I showed deceptive on a question, I certainly would remember what the question was. 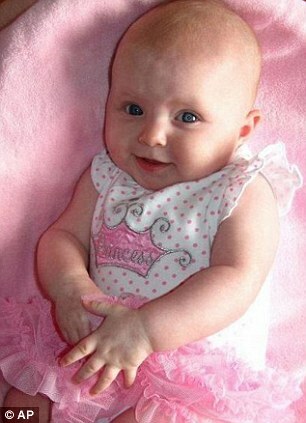 Police are have questioned a teenage neighbour of the parents of a 10-month-old baby that has gone missing in Missouri. Lisa Irwin has been missing from her Kansas City home since Monday night. On Friday, forensic experts took a DNA sample from the neighbour who had been at the Irwins' home the day Lisa vanished. The neighbour also knew the access code to the family garage, ABC reported. Investigators are also looking into a second lead, after a couple in California were seen with a small child fitting Lisa's description, relative Mike Lerette told KMBC-TV. 'They're pursuing surveillance tape on a couple with the baby in California,' said Lerette. The investigation into the disappearance of baby Lisa took a grim turn yesterday as the FBI revealed it has begun searching a landfill in Kansas as part of its search for the 10-month-old who disappeared from her crib four days ago. More than a dozen investigators were at the waste dump, 23 miles from the Kansas City house where she disappeared, for several hours today although they did not appear to remove any evidence. The mother of the missing baby revealed yesterday police had accused her of having a role in her 10-month-old daughter's disappearance from her Kansas City home. 'From the start when they've questioned me, once I couldn't fill in gaps, it turned into "you did it, you did it," Deborah Bailey, 25, told Good Morning America this morning. Police say the baby's parents have stopped cooperating with investigators and Bailey admitted to failing a lie detector test. The Deffenbaugh Industries Johnson County landfill is across the state line in Shawnee, Kan. The garbage collected in Kansas City goes to the Shawnee dump. But the couple are sticking to their story that little Lisa Irwin was abducted from her crib after Bailey put her to bed at 10:30pm Monday. Jeremy Irwin, Lisa's father, says he came home from work at 4am Tuesday and found the front door unlocked, his daughter's bedroom window open and Lisa gone. Well the baby looks well cared for, but then so do Caylee Anthony. As to the the tip from a couple in California, babies look more alike than do small children, I have absolutely no belief in eyewitnesses - there was not one credible one of that whole bunch in the Anthony case. I drove by the landfill they were searching today. I ts huge I dont know how they would find anything in it. artgal16 wrote: Well the baby looks well cared for, but then so do Caylee Anthony. As to the the tip from a couple in California, babies look more alike than do small children, I have absolutely no belief in eyewitnesses - there was not one credible one of that whole bunch in the Anthony case. I agree about the CA tip, people do that all the time in these cases, I never get my hopes up with those. The neighbor girl that LE interviewed thou', I hope we hear more about that. I don't know what to think with this case, it goes back and forth so much between LE and the Mom/Dad. I just hope this little girl is found safe and sound like we all do. What a pretty little baby. I love the pink tutu. but I agree with you guys, Caylee's pictures were all perfect too. I'm hoping she did not suffer the same fate and is alive and well somewhere, soon to be reunited with her family. I have to ask. Do bones burn and turn to ash or do they remain intact when set on fire. Jeanne my understanding is the bones do not burn to ash when set on fire. It takes hours of intensive heat to turn bones to ash. But a baby this age has soft bones so I have to wonder as you are. Thanks for saying that Laga. I learned this when I had my father cremated but couldnt think of a good way to say the grinding thing. I dont see any way it could be trying to get rid of a body burning it in a dumpster. I was thinking maybe her clothing. It was stated on our morning news that there is a handy man from the neighborhood who hasnt been seen since the day before Lisa came up missing. Im hoping this is a good lead but I wish they would give a name and description of this man. Im only 2 hours away and could possibly see something.